What Does The Bible Say About God Taking Care Of You? Does the Bible say anything about God taking care of you? If so, what are some verses that mention this? It is clear that God cares for His creation. Read what Jesus said in Matthew 6:26 “Look at the birds of the air: they neither sow nor reap nor gather into barns, and yet your heavenly Father feeds them. Are you not of more value than they” and verses 28-30 “And why are you anxious about clothing? Consider the lilies of the field, how they grow: they neither toil nor spin, yet I tell you, even Solomon in all his glory was not arrayed like one of these. But if God so clothes the grass of the field, which today is alive and tomorrow is thrown into the oven, will he not much more clothe you, O you of little faith.” How obvious it is that God cares for His creation and His creatures and all created things. There are literally dozens of Bible verses in the Old and New Testament that show God does care for His creation and cares for His creatures; the plants, birds, creeping things, animals, mammals, and the fish in the sea. So my question to you is don’t you think He also cares about taking care of you? Our natural tendency is to look beyond today and stress about tomorrow which we cannot even control nor do anything about. Jesus knew we’d be like this which is why He said “Therefore I tell you, do not be anxious about your life, what you will eat or what you will drink, nor about your body, what you will put on. Is not life more than food, and the body more than clothing” (Matt 6:25). He then goes on to ask a rhetorical question, “And which of you by being anxious can add a single hour to his span of life” (Matt 6:27). The obvious answer is we can’t add a single hour but on the contrary, worry and anxiety can shorten our lifespan as it creates stress and weakens our immune system. If we want to obey Jesus then follow this command of His; “Therefore do not be anxious, saying, ‘What shall we eat?’ or ‘What shall we drink?’ or ‘What shall we wear?’ For the Gentiles seek after all these things, and your heavenly Father knows that you need them all. But seek first the kingdom of God and his righteousness, and all these things will be added to you” (Matt 6:31-33). This “do not be anxious” is an imperative command and we could read it like this; “stop being anxious about tomorrow” as Jesus concludes this paragraph by commanding us all, “Therefore do not be anxious about tomorrow, for tomorrow will be anxious for itself. Sufficient for the day is its own trouble” (Matt 6:34). We have already read that God provides for His creatures and cares for them and we’re of much greater value to Him than they are and also that we’re commanded to stop worrying about our needs. We have no reason to be anxious about His care for us because Jesus tells us “your heavenly Father feeds them. Are you not of more value than they” (Matt 6:26b)? The answer to that is undoubtedly yes, God does care for us more than His created creatures. Since He makes sure they are fed, don’t we believe He will care for us since we’re of a much higher value to Him than they are? When we have anxieties come upon us, and we all will, then we are to be “Casting all your anxieties on him, because he cares for you” (1 Pet 5:7). This means “all” anxieties…not just most of them. Easy to say but so very hard to do, I admit. If you’re worried about anything at all try to think of the creatures of the earth. Paul tells us, “do not be anxious about anything, but in everything by prayer and supplication with thanksgiving let your requests be made known to God” (Phil 4:6). God promises those who are His that they can depend upon Him in all circumstances and at all times. Since we know that God does not change (Heb 13:8) what makes us think that He will do anything less for us than He did for those of ancient times? 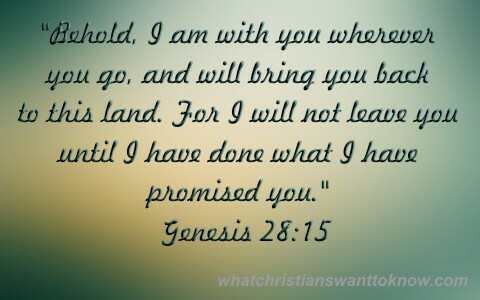 Just as He told Jacob, “Behold, I am with you and will keep you wherever you go, and will bring you back to this land. For I will not leave you until I have done what I have promised you” (Gen 28:15), just as He told Moses when faced by the powerful Egyptian army “Fear not, stand firm, and see the salvation of the Lord, which he will work for you today. For the Egyptians whom you see today, you shall never see again” (Ex 14:13), He tells us today “do not be anxious about tomorrow, for tomorrow will be anxious for itself. Sufficient for the day is its own trouble” (Matt 6:34). Trust Him, believe Him, and know with a certainty that God cares for you and will take care of you just like He did yesterday, just like He will today, and just like He will tomorrow. I will be the first to raise my hand and admit that I sometimes have anxiety about my needs and worry about the uncertainty of tomorrow. However if I keep abiding in His Word and read all of His great and precious promises and see the history of His provisions for those in the past from Scripture, I will tend to be less stressed. I will also believe that God surely does care for me and will take care of me. Read more about God’s love here: Why Does God Love Us? I have a problem in my life. I want to know Christ more and spend more time praying and worshipping Him, but I just can’t seem to get excited about it. I see many people with amazing testimonies and story of how God dramatically changed their lives and they live out their lives in a godly way, and I feel like I need something like that to help me along my way to a more godly life. But I just can’t get myself excited to learn more about Him and spend time with Him. What should I do? And does everyone have that moment where God is revealed in perfect light, or only some people? Hello Tim. I would talk with your pastor about this right away. Call him and schedule an appointment. How much do you read your Bible? Is it every day? If so, how much time? If not, why not? What about your prayer life? What amount of time do you spend in prayer? Does everyone have that moment where God is revealed in perfect light? No, that is not my experience. Job had a hard life, so did Paul, and Jesus most of all. You depend a lot on feelings it seems and that is subjective but the Word of God is objective truth. The times when you feel like not reading your Bible and praying the very most is the absolutely most crucial time that you need too. I read my Bible occasionally, usually on Sundays. I read it for about a half hour when I do. I pray usually before meals and sometimes in the evenings, but I feel they are not adequate. Any advice on how can I make more time for God and make it better? @Tim, I just wanted to say, I think it’s awesome that you desire to have a closer relationship with Christ! Don’t lose hope! Keep on reading your Bible and praying. Pour out your heart to God. He loves you! He hears your prayers. He will answer them in his own timing. God bless you!! The things of God are usually boring to the natural man. I would like to know more about you and your experience with Jesus and what you believe. Things I would ask you are whether you believe Jesus is God. Do you believe He created all things including this natural universe in which we live and all things that exist both visible and invisible? Do you believe that we are sinful human beings and headed for hell(damned) from the moment of conception? That the only hope for us escaping damnation is to believe in Jesus’s payment for our sins on the Cross..believing also that Jesus rose up from the grave. Then believing these things, have you asked God to fill you with His Holy Spirit? Have you experienced the second birth of God’s filling you with His Presence in answer to your prayer? Without these necessary steps the Bible will still seem cold and boring, for the Word is opened to our understanding and speaks to us as we understand it through Jesus’s Spirit living inside of us. Pray as we might, there is no hope without belief in Jesus. He loves you and wants you to grow in love for Him. Trust…belief comes first. All else is vanity and wind. All our efforts to get closer to Him are in vain. We cannot do it. That is why He offered His Son, that you might rest in His love and cease from your efforts to get close to Him outside of faith and trust. Ray Comfort speaks of jumping from a plane. We might try it and want, hope and pray we might fly, but unless we have the parachute on we will perish. Same with Christ. He is our parachute. Trust in Him and then jump, resting in the knowledge that you are free in Christ. He will be close to you, for He will live inside you by His Spirit. He is not far away or distant for the believer. He knows you by name. (1 Cor 3:16).